TUB-HT | S&P Canada Ventilation Products, Inc. The heavy-gauge design allows for years of standard commercial use and the dependability required in a fire emergency. The upblast configuration exhausts heat and smoke high above the roof line aiding in the access and capabilities of fire fighters. Unlike complete design dependence on gravity vents which are sometimes limited by air temperature and wind velocity, the TUB-HT in conjunction with gravity vents, will more effectively remove smoke, hot air, and gases when used in a properly designed system. In the event of electrical failure, the 165°F fusible link will activate the spring assisted damper doors to provide gravity ventilation. 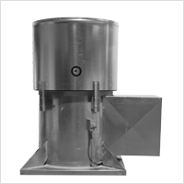 Fan CFM, sizing and location for both exhaust and supply air are an important part of the overall heat and smoke venting building design needs. Refer to I.R.I., NFPA (National Fire Protection Association), and local fire codes for help in proper system design. Final approval for the complete system design should be authorized by the local authority having jurisdiction. Fan selections are available in 24, 30, 36, 42, 48, 54 and 60 inch sizes. Horsepower and CFM range to 57,000 CFM and 15HP. Units are tested in accordance with AMCA Standard 301 (sound) and AMCA 210 (air) in an AMCA certified laboratory. Every unit is completely assembled and factory tested for quality assurance prior to shipment.